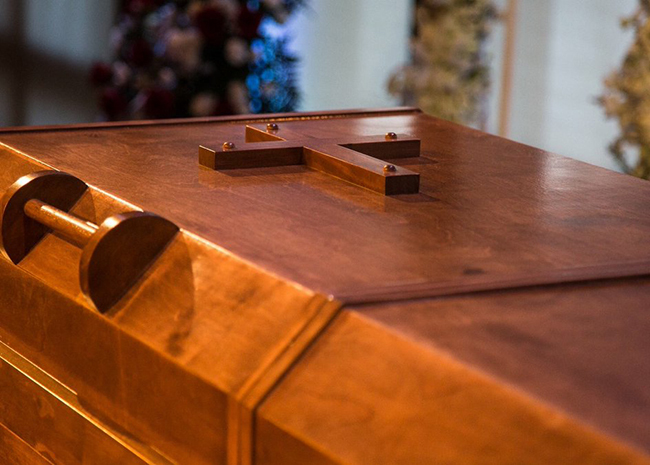 As thousands paid their respects to “America’s pastor,” images of Billy Graham’s pine plywood casket was on prominent display on smartphones, computer screens, and televisions across the nation. During a 2005 ministry visit to Louisiana State Penitentiary in Angola, Louisiana, Billy Graham’s son, Franklin Graham, noticed some inmates building the plain plywood caskets. Inmates had begun building caskets when then-warden Burl Cain learned some of the prisoners dying at Angola Prison were being buried in cardboard boxes because their families could not afford a funeral, let alone a casket. At Cain’s direction, inmates began constructing the plywood caskets, not just for others but also for themselves. And some of the prisoners—who were once hardened criminals—were now new creations in Christ praying over the caskets as they were being constructed. Captivated by the story behind the construction and beautiful simplicity of the craftsmanship, Franklin Graham had two made in 2006 for his parents. The names of the inmates—including Richard “Grasshopper” Liggett—are burned into the wood. The caskets cost around $200 each to make—just a fraction of the cost of a standard one purchased through a funeral home. Each is lined with mattress pads and has a simple wooden cross nailed on its lid. Billy Graham’s wife, Ruth, who often visited prisoners and offered hospitality to many in her home upon their release, passed away in 2007 and was buried in her plywood casket in the Prayer Garden on the grounds of the Billy Graham Library. Billy Graham was buried next to her after a private funeral on Friday, March 2. Billy Graham saved my family back home in India. And he prayed over my parents to have children. As a result of this today my son and his wife serving in the church. God bless him & his family. God bless America. 💘 He was very much loved by my Mother Rose, 94 year young, and myself. He will be greatly missed. God bless you and his family in JesusMighty name, absent in the body, now present with the Lord. Healing hugs and healing kisses sent your way! CAN the public purchase these caskets..What is the price, shipping..? What and awesome casket . So much workmanship and love put into it . Such talent . God bless all the prisoners . Praying for all .